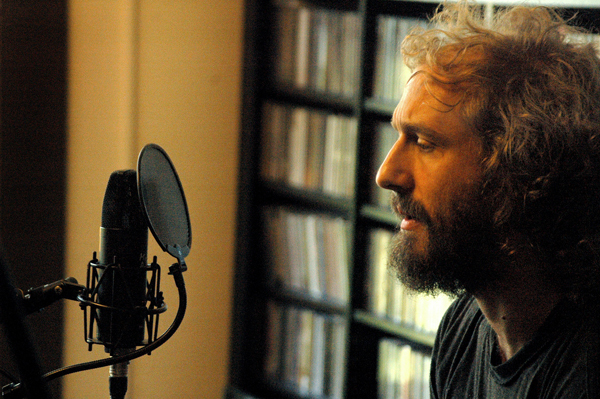 #NP: Phosphorescent - "Song For Zula"
I noticed this song in Pitchfork's best new tracks section yesterday and I'm really glad I decided to give it a listen. I'd never heard of Phosphorescent before, but after reading P4k's write-up I see Matthew Houck, the project's mastermind, has been kicking the dust around for awhile. He's done experimental folk, and straightforward alt-country on past albums, and this song seems to be a nice combination of his previous styles. His vocals sound like those of a rugged country/folk singer who smokes way too many cigarettes, but the instrumental backing him is a beautiful, string-laden, electronic composition. "Kicking the dust around" is perfect imagery to apply to this song. It sounds like Houck is stranded in a desert somewhere speaking to an angel or a ghost from his past during a moment of beautiful introspection. This song is about love, how it can enslave you. "Some say love is a burning thing/ that it makes a fiery ring," Houck sings, paraphrasing Johnny Cash, "Oh, but I know love as a fading thing just as fickle as a feather floating in the stream." Later he says that love is a "Cage in me, just a killer come to call from some awful dream." He clearly isn't too keen on romance, or maybe he's talking about more than romantic love here. Maybe he's saying that sometimes love in general can misconstrued as something that involves one destroying oneself in order to make others happy. In the end, one is left "disfigured" and unrecognizable as Houck says he was to himself in the first verse. This is the kind of love that he'll never let himself fall into again. However you interpret "Song For Zula", it is definitely a great ballad to living a lonely, simple and self-sufficient life and being all the happier for it. Sometimes a person is just better off on their own with nothing to ground them but their own two feet. And I am racing out on the desert plains all night." If you can't tell by now, the lyrics in this song are beautiful and raw, which also describes this song as a whole. It's over six minutes, but each time I listen to it it feels like only a few moments have passed. That's always a good sign. "Song For Zula" is definitely one that will stand the test of time and will be played and loved long after 2012 comes to an end.